The Detroit Lakes City Council will meet on Thursday, January 25th to review elements of the West Lake Drive Plan. Concepts have been presented at two open houses, resulting in changes to the plan over the last few months. Now, the city council will review the concepts in the plan. Thank YOU for your input, ideas, and feedback. Below is a copy of the current Development Concept. 1. City Council to review concepts presented at open house meetings. 2. City staff to review draft of plan for spelling, grammar, and clarity of concepts. 3. 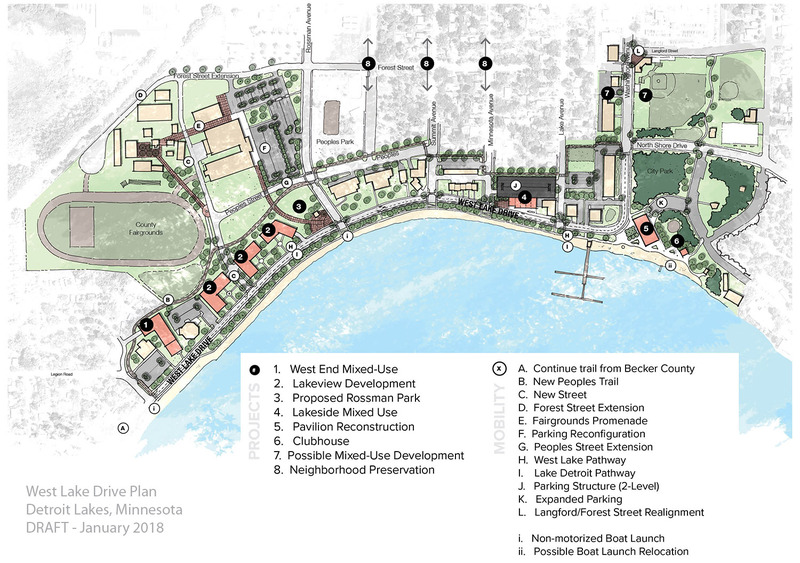 Detroit Lakes Development Authority (DLDA) to review draft for clarity of concepts and additional feedback. 4. Plan posted to this site for public review and feedback.